Ojinguh dupbop is a spicy squid dish made with ojinguh bokum over steamed white rice (bop). 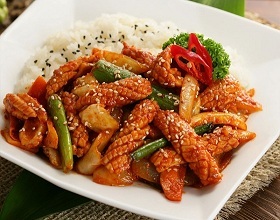 In Korean, dupbop literally means "over rice" so fresh squids are cut into bite-sized pieces then pan stir-fried with spicy gochujang along with gochugaru and served with steamed white rice. Assortments of vegetables that can be included in the spicy sauce mix are green & red chili peppers, mushrooms, green onions, carrots and onions. Buy delicious & authentic Korean kimchi online. Brought to you by NY's Kum Gang San restaurant.